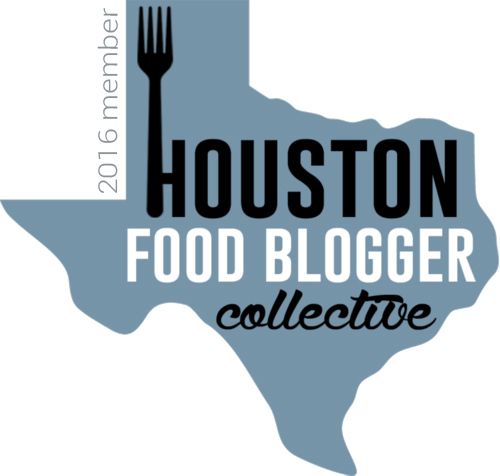 Houston is continuing its mission to prove me wrong, and I feel exceptionally good about it. I recently made the statement that Houston's brunch game isn't the strongest. Houston got t.o. 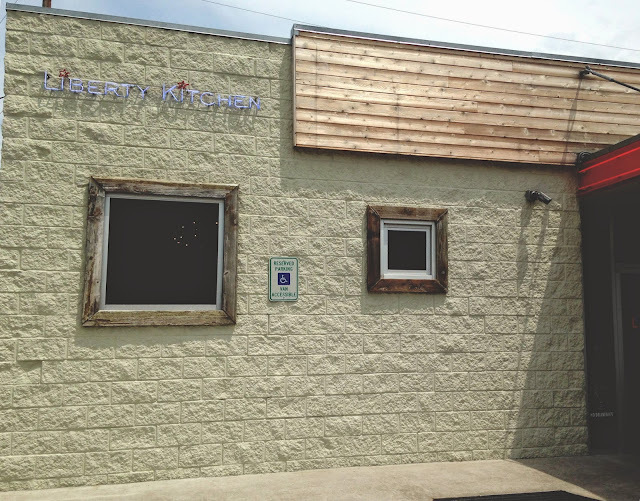 'ed about it, shoved Weights + Measures into my hungry belly, and now has smacked me in the face with Liberty Kitchen & Oyster Bar. And I repeat: I feel exceptionally good about it. 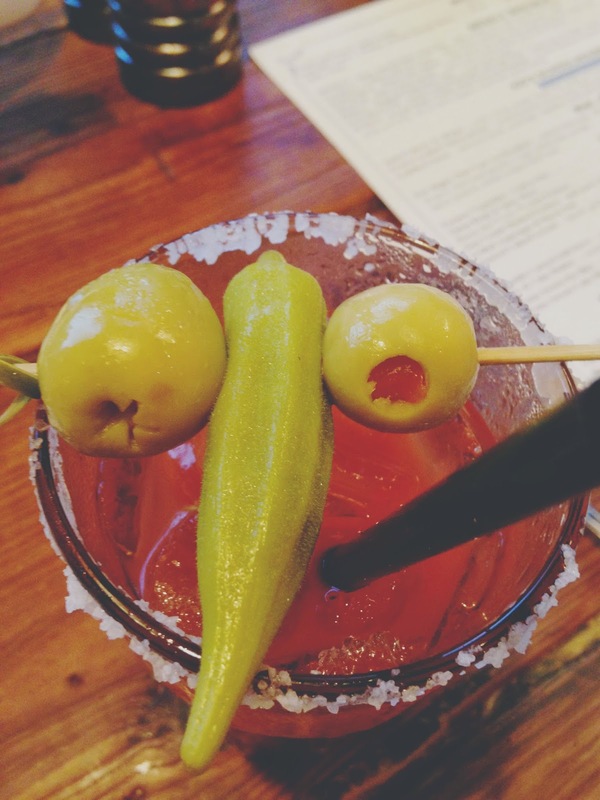 ^ I also feel exceptionally good about the fact that the olives and PICKLED OKRA ARE YOU KIDDING ME atop my bloody mary resembled a face! My good friends Lenny and Christy were visiting from Massachusetts recently for Christy's birthday weekend. After having a completely tame large Saturday night out, a big group of us made our way over to Liberty Kitchen & Oyster Bar the next day for brunch. Besides loving the funny face on my bloody mary, I also simply loved my bloody mary. The mix was full and not watery, and it had a nice kick. But the garnishes were what really sealed the deal for me. The course salt on the rim and the pickled okra (omg) were just the little zingers I needed! 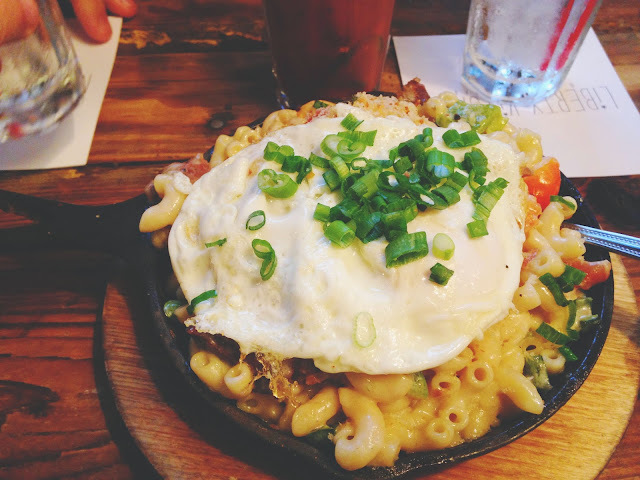 The beautiful mac and cheese pictured above was ordered for our table. I tried to pick around the meaty bits to give it a taste, but I couldn't really do it. It looked delicious though, and my friends were all fans! If we're being honest with each other here, I must admit I was very disheartened when I first looked at the menu. There wasn't really anything in the way of vegetarian entrees to choose from, aside from a plain mac and cheese (but sometimes you go to brunch already having had leftover cold Kraft mac and cheese for breakfast, IF we're being honest with each other). Seeing as I am living in the 4th largest city (almost 3rd, WHATTUP H-TOWN) in America, I've gotten used to restaurants - especially popular ones - having a couple of veg options for me to choose from. Maybe I'm spoiled. Fortunately, I've also gotten used to getting creative and piecing together my own meals. So piece together I did! I ordered the liberty eggs benedict without the pork belly. I also asked them to add in sauteed spinach. And holy cannoli was it ever amazing. 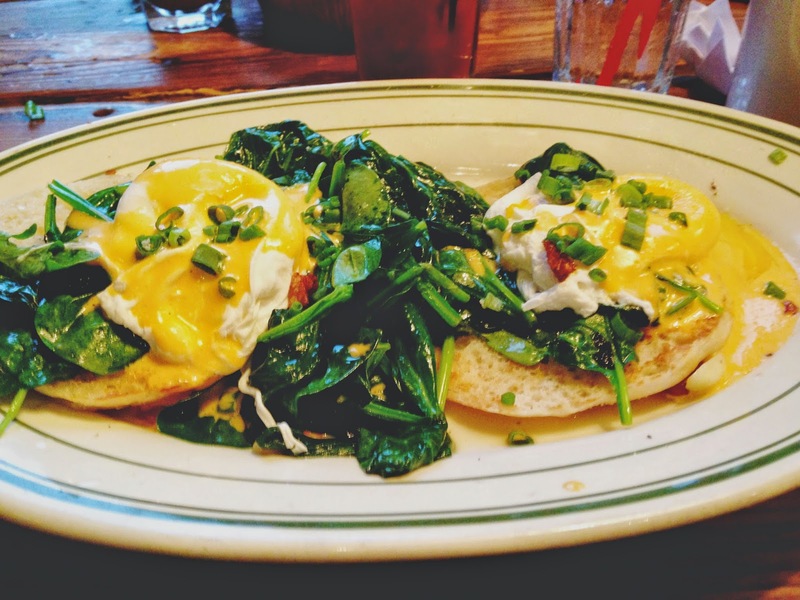 The beautiful, runny, oozy poached eggs swirled around with the gorgeous, garlicky, sauteed spinach, and divine, silky hollandaise, and the end result was sensational. The thin English muffins were a bit soggy underneath the food symphony overhead, but I wasn't too put off by it. I was too busy going crazy over the other stuff. They forgot my breakfast potatoes (which come with the eggs benedict), so when I asked about them, our beyond friendly, bubbly server sped away and brought me some almost immediately. 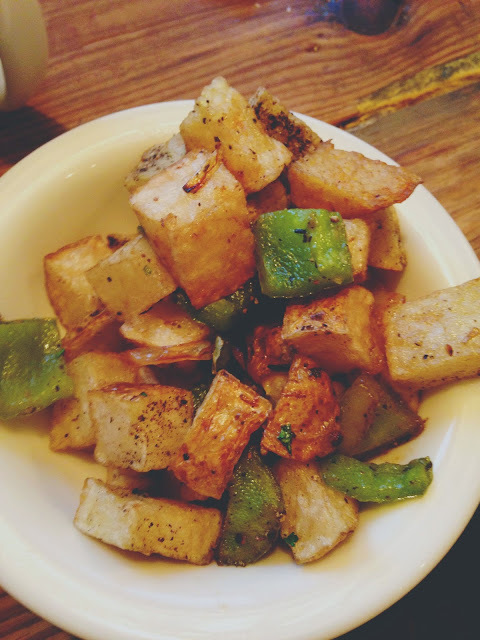 They were standard breakfast potatoes, nothing out of the ordinary. And FYI, here's my simple measurement for determining if a side of breakfast potatoes is extraordinary or not: Whether or not I need to add ketchup. If it needs ketchup, it's ordinary. I enjoy it for what it is, don't get me wrong (because, hullo, POTATOES). But if it does not need ketchup? EXTRAordinary. This side of potatoes needed ketchup. But darn it, I still enjoyed it. 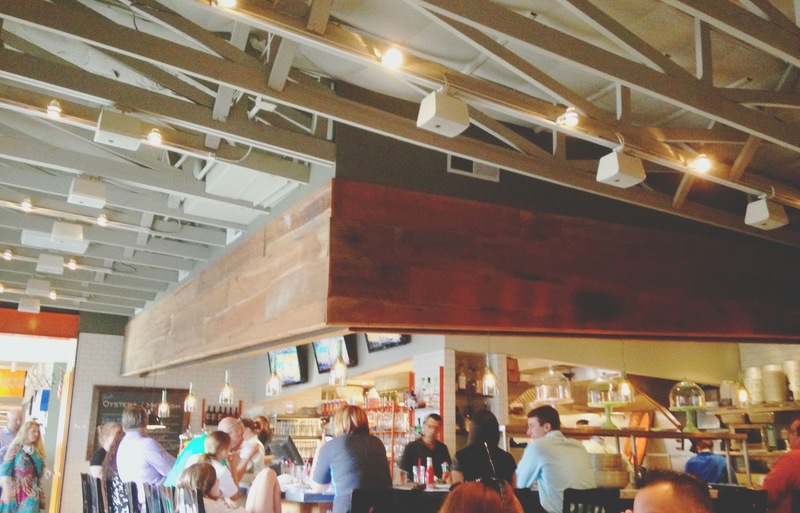 Brunch at Liberty Kitchen & Oyster Bar is hella good. While it is a bit on the pricey side, I was able to justify the higher bill with the higher quality of food I received. And while I was disappointed in the lack of obvious vegetarian options, the staff was quick to accommodate my diet, and my disappointment quickly dissipated. The lively environment, excellent service, and top notch food have made Liberty Kitchen & Oyster Bar one of my new favorite Houston brunch spots!